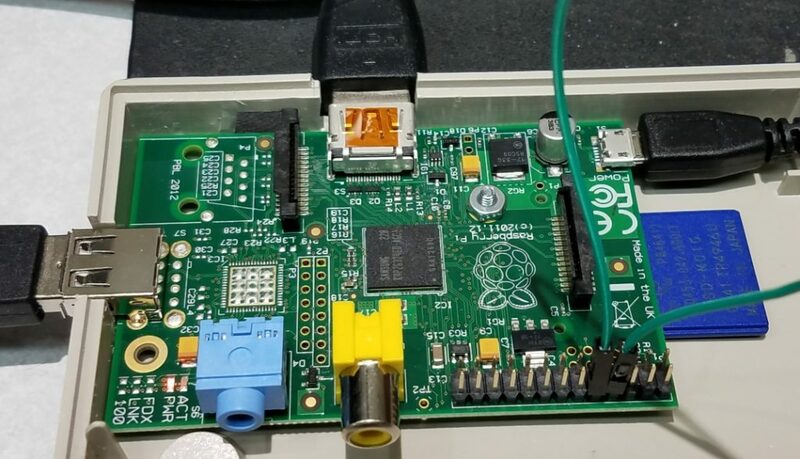 TL;DR; rPi firmware installation and troubleshooting. PiGFX is located at: https://github.com/fbergama/pigfx?fbclid=IwAR1-AOMMtR0iOuaQAmUgeQPbty2tmBa8ILsbNYOb5v-wPQC_UYzudv06IYY The “kernel.img” file that you need can be downloaded from this site. The instructions say that “start.elf” and “bootcode.bin” are available in that github /bin directory, but I found that to not be the case. You also have to make a “config.txt” file on the root of the SD card. After loading up the SD card I popped it into the rPi. I was happy that the original Pi that I had (without ethernet jack) fired up and showed something on screen. Better than nothing, right? So this was a bit of garbage on the screen. I suspected that it was noise picked up from the open serial input pin. To test this I put a green jumper wire from serial out to serial in. So with this jumper in place, the text typed on the keyboard should go to the serial output, loop dizzyingly through the green wire, and return to the serial input thus being displayed on the screen. Colorful! 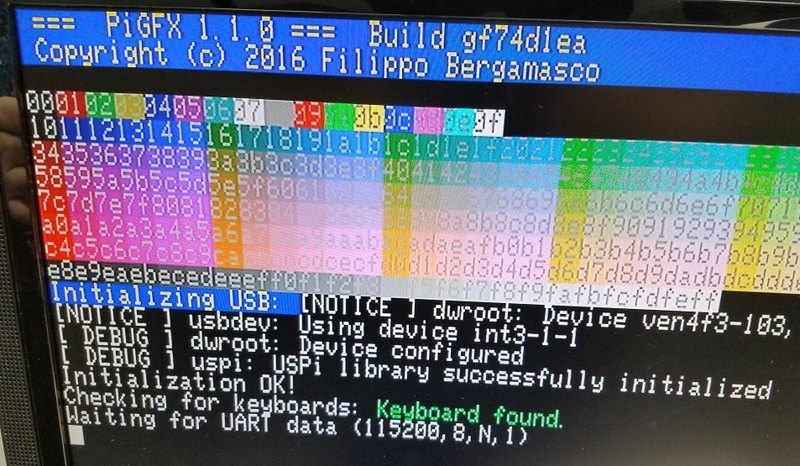 The startup screen also shows that the USB keyboard that I plugged in to the rPi was found. Oddly, though, when I typed something on the keyboard this time, nothing showed up on the screen. I unplugged the green wire, immediately got noise on the serial input which cleared the startup screen and displayed random characters (like before) and only then anything I typed on the keyboard was displayed. With a successful loop back test performed I connected this hardware to a microcontroller board that I knew was set to communicate at 115200 baud. After a little bit of troubleshooting, I hooked up a scope to the serial output to verify the baud and it was way off. The reason? I failed to copy the “config.txt” file to the SD card. Without that config information, the serial port runs too fast. Here is the file for the SD card, so that you can just download it to your own SD card. With that file correctly added to the SD card, I was able to communicate with my target. Unfortunately I discovered a problem with the PiGFX terminal code. My microcontroller board depends upon the ability to move the cursor to some absolute screen positions using escape sequences. The PiGFX firmware is supposed to support this, but the original developer assumed that the upper left screen position was location 0,0 when it should be 1,1. In old terminals that upper left position was line 1, column 1. The screen positioning starts at 1, not at 0. I’ve contacted the person that is maintaining the code with this issue. The PiGFX itself is still useful. And the PiGFX in this Workbench Retro Computer will still be useful, but it would still be better if this was fixed.